Taxi Drivers (Sounds crazy I know, but they are always looking for money making ideas and I would suggest contacting them face-to-face to present your ideas. When you do call these prospects you could offer them one of two things, first you could offer them a commission for referring you business. Your second option would be to offer them referrals in return for their referrals. It�s a great idea, huh? Oh, so now you want something you can bite your teeth on? If you don�t ask, you don�t get, are you ready? Ok then, below I've included an example "Mr. 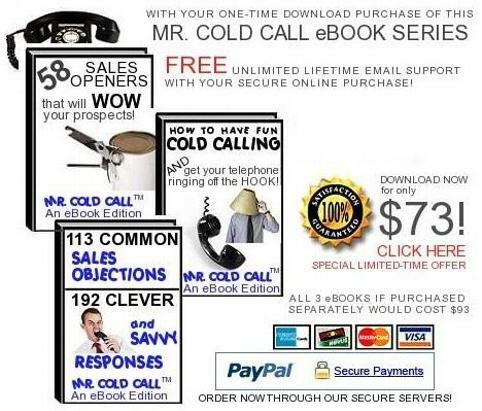 Cold Call Opening Statement." PROSPECT: "(they will laugh and may say) Is that right? (or they may say) Why is that? (or they may say) Ok?" How does this example sound? Here are a few things to keep in mind, first, make sure that you stay in contact with your referral source every few weeks or at least once a month. Secondly, once you do have a verbal agreement I then suggest that you put this into writing. If you really want to legitimize this agreement I would then have both parties sign a contract. The idea of having a signed contract is not necessary, however, it does bind both parties to an agreement and a common goal.